This watch looks way better in person and after wearing it for a few days I'm hooked on its styling. The 4R36 movement has hacking and hand winding, both of which are handy features but not 100% nessisary for the average person. However having those two features is something I do welcome and will use anytime I need to set the watch or wind it. The rubber strap is as comfortable as my Casio G Shocks but with a softer feel on my wrist, however the band is a bit stiff in terms of pliability. Its hard to describe, the band is soft yet stiff weird. The watch looks allot better in person and really look great in any kind of situation. The gold really accents the blue nicely and the slightly dark finish on the watches case finish off everything nicely. The Lume on this watch is very abundant and bright making it easy to tell time in a variety of lighting conditions. One thing to not is that this IS NOT a dive watch! Its a sporty dive inspired watch. Allot of people confuse the two. 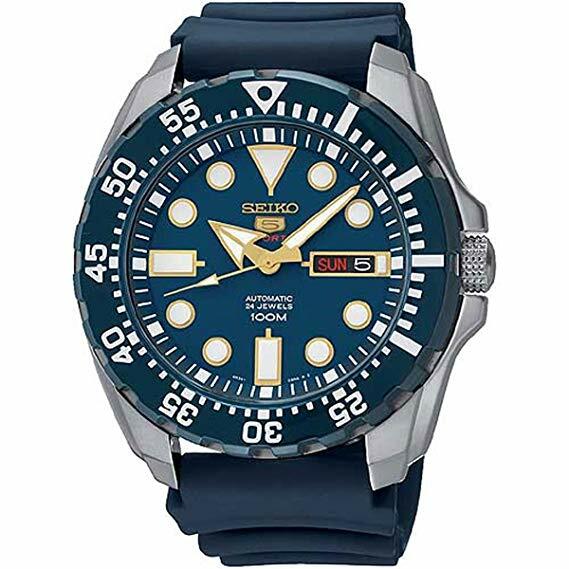 Seiko is very clear on which of there watches are dive watches and which are not. The watch doesn't have a screw down crown nor does it need one. The bezel does rotate but again, its not a dive watch. Al in all if your looking for a stylish time piece then I think this is it! Just picked this one up yesterday, did a lot of research before my first Seiko 5 Sports watch and this is the one I chose. Why this model? I wanted a dive watch that wasn't too expensive yet would look nice. I was also looking for the latest watch movement, which in this range is the 4R36. This movement allows hand winding and has a hackable second hand, as well as a 24 jewel movement. Once I got it I swung it back and forth for about a minute to wind it and will probably do that twice a day just to make sure it's wound properly although my understanding is that it should have power for about two days if left by itself. So far the accuracy seems pretty good, I've been testing it against an online atomic clock and it seems to be keeping pretty close to it over the two days I've had it. I think I might get a leather strap for it to replace the rubber strap it came with although the rubber strap itself is not bad. This particular model came out in November so still fairly recent for a Seiko 5 new release. The photo on the Amazon website doesn't do it justice, I recommend googling the model number to find more images and also visiting the website. yeomanseiko for some better pics. Very happy, looking forward to many years of use. Just wanted to update, still running great, really like it. Update on daily accuracy: Gains about 5-7 seconds per day which I understand is pretty good for an automatic watch. Performance-wise, this is an amazingly great watch which has been running within 2 seconds per day for the last several weeks that I've owned it and it has lume that is almost equal to my SKX. Appearance-wise, Seiko did a great job in designing this down-market, entry-level model and while it's not the most attractive watch that I'll ever wear, it looks considerably better than typical automatics in this price range. To my eye, its biggest drawback is the polycarbonate bezel but it's nicely appointed in navy blue and it doesn't at all scream 'cheap'. I got it because I wanted the 4R36 movement and this was the cheapest model available with it. I'm *really* glad that I did and I wouldn't hesitate about buying it again. If it looks pleasing to you and you're looking for a watch like this, I don't think you should hesitate about buying it, either.